Fire Emblem: Fates seeks to hit the heights of war epics, a word that has been misconstrued often when it comes to games. Rather than simple scope or size of world, the epic that Fates aspires to is closer to tales like Homer’s Iliad, one about a war that encompasses not just great distance, but a great many lives and, in some cases, lifetimes. The Fates trilogy, broken into three separate games rather than a single entry, seeks to reach those peaks of epic, and although the presentation can muddy the waters, this three-part saga of love, loss, and war is one of the best the series has to offer. The structure of Fire Emblem: Fates is strange, as it is a full story divided into three distinct pieces, told through three games: Birthright, Conquest, and Revelation. As a part of the royal family of a kingdom called Nohr, you have led a sheltered life in a castle with your retainers. Your brothers and sisters adore you and train you, but your father, King Garon, seems distant and apathetic to you, until he calls upon you to investigate a fort as a rite of passage. On this mission, you’re captured by Nohr’s bitter enemies, the prosperous kingdom of Hoshido. While Nohr toils in darkness and disparity, Hoshido revels in bright colors and fruitful harvest. As you learn from your Hoshido captors, you’re not a member of the Nohrian royal family; you were born to the Hoshido clan, and stolen at birth by King Garon and Nohr soldiers. After a major event sparks war between the two nations, you’re trapped between the two families and are forced to choose: your loving adopted family, or your bloodline? These play out in the stories of Conquest and Birthright, respectively, as each campaign tells one side of the story. Birthright is a more modern Fire Emblem campaign, allowing you to take on extra battles and other challenges to level up units outside of story battles, while Conquest takes the traditional path and restricts you on extracurricular activities, making the most of every conflict. Revelation is the third option, where you elect to side with neither family, and learn the truth about the conflict and the real enemy behind the scenes. It mixes the playstyle of the first two, though it more closely resembles Birthright than Conquest. Splitting the story up into three portions could have made the overarching narrative feel piecemeal and indeed, in some sections in it did feel like I was re-treading ground from other campaigns because I had to, but for the most part the story stays cohesive and compelling. It’s not a particularly heart-rending tale, but Fates doesn’t pull punches in being willing to kill off main characters or core players when it needs to. The thing I missed most was the political intrigue of other titles like Sacred Stones, as Fates dwells more on the personal relationships between characters than the overarching reasons for war and conflict. This story is about the warriors in your army, and the story they tell through the way they learn to fight and stand together. It’s in the character relationships Fates excels, in both quality and quantity, through the support conversations. There’s a rather large amount of supports available, either platonic or romantic, and a new A+ ranking for characters that equates to a “best friends forever” in place of an S-rank marriage. If the idea of playing matchmaker between and during battles, always pairing up and placing lovebirds next to each other is an appealing concept to you, Fates will sate your desire for a long, long time. It’s because of the length of these campaigns you get the time to flesh out the relationships of your many combatants, as each entry of Fates is the size of any other entry in the series. These campaigns span dozens of maps, and employ a number of different objectives and situations. Even when I was replaying the same map in another campaign, it was with a different set-up; while I had rescued a villager in a town in Birthright, in Revelation I was hunting a sorcerer through a blocks of magical ice he had created throughout the same town. Luckily, between campaign missions or random encounters for levelling or support-farming, you can retreat to your castle and entertain a variety of side activities. Your castle is your army’s home, and it has everything from weapon and item shops, to a lottery, to even a private quarters where your main character can spend some extra time with that special someone. A side mini-game of castle invasions also takes place here, and you can take on either computer enemies or human players in a battle of wits, as your forces and what defenses your castle has takes on an invading force bent on seizing your throne. 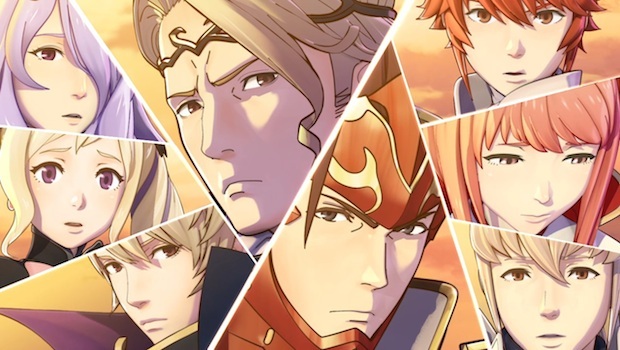 Combat is the same Fire Emblem, but with a number of adjustments and changes that make the overall experience much less infuriating, and more focused. Classes have been revamped, and many characters have unique classes, like Maid or Oni Savage/Chieftain. One of my biggest issues in previous Fire Emblem games was the necessary evil of thieves, the only units that can open doors and chests without keys. They’re nigh-useless in combat, but in campaigns they’re invaluable for getting the key items locked away in those chests. In Fates, thieves are replaced mostly by classes able to fight, like Ninja and Puppeteers, and have their own weapon type called Shurikens. More than simple walking keys, these units can now fight on the field and feel much more useful in combat. The other major change is that, at least in the lower difficulties, weapons no longer have limited uses. Though staves and other healing items have a number of times they can be used before breaking, your units’ weapons have infinite durability. This is a major bonus to those frustrated with having to take stock of weapons and count swings during a heated battle. Previously, I had been paralyzed from ever using units that only use rare weapons, like beaststones and dragonstones, because they have a limited number of uses. This reluctance often led to myself, and many other players, neglecting to use those units at all. Fates alleviates this problem, and while I can’t speak to the more veteran difficulty, at least in casual play, you won’t have to think about those issues anymore. Fates is a war epic that spans not just dozens of maps but several campaigns, with a battle system that feels refined and focused, and characters that are as endearing as they are varied. The only issue I’ve found is the sheer wealth of content; although it offers more Fire Emblem, in a more cohesive package than ever before, it also means you make a big investment in playing this game. The form factor might also be an issue for some, as the true overarching story doesn’t fully form until the latter half of Revelation. Although Birthright and Conquest stand up as solid entries in their own right, they’re clearly building blocks to the greater picture, and through each campaign there’s always a lingering sense of needing to beat all three to get the full Fates effect. The cost, both in time and money, is fairly significant to get the whole of Fire Emblem: Fates, and it doesn’t help that the only option to get all three on a single cart is widely unavailable as of this writing. If you’re willing to make the investment, though, Fire Emblem: Fates is likely to be a defining game for the series. It’s the tepid steps forward from 2012’s Awakening being realized, and even more concepts being expanded and refined. It’s one of the best and biggest entries in the franchise, and if you enjoy tactics, war stories, or just playing anime matchmaker, you’re bound to get weeks and even months of enjoyment. Fire Emblem: Fates is easily one of the biggest and most intimidating entries in the series, but the refined systems and sheer breadth of content, mixed with a colorful and memorable cast of characters, makes this a grand offering for both Fire Emblem faithful and newcomers alike.